Dragon slayers unite! This little guy is going to be busy conquering all these dragons this print has to offer. Blue, green, yellow, purple, and even pink dragons of all shapes and sizes are the highlight of this design. With the variety of colors that pop on the black background decorating with be a breeze. A white outlined yellow band with a yellow circle label highlights the little dragon slayer. 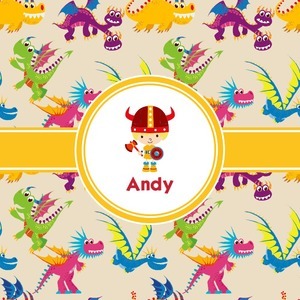 Change the hair color to match your little guy and add his name to make this a fun design for all dragon lovers.